Following on from our earlier analysis of the underlying principles of the industrial minerals business (see Part 1: Overview, structure & key takeaways), here we discover what makes it tick, by highlighting the industry’s drivers, influencing factors, and keys to success. All these aspects of the market and more will discussed and examined at the upcoming IMFORMED Rendezvous, Les Jardins du Marais, Paris, 8-10 April 2019. Industrial minerals are used in a wide variety of applications, and each mineral serves multiple markets with tailor-made grades. Is it therefore possible to identify key market drivers, influences, and requirements to lead an industrial minerals project to success? To have any value, and any potential for development, an industrial mineral source must be able to economically deliver an acceptable product to a market in demand. As indicated in the above chart, industrial minerals are absolutely essential in the manufacturing of all kinds of products. 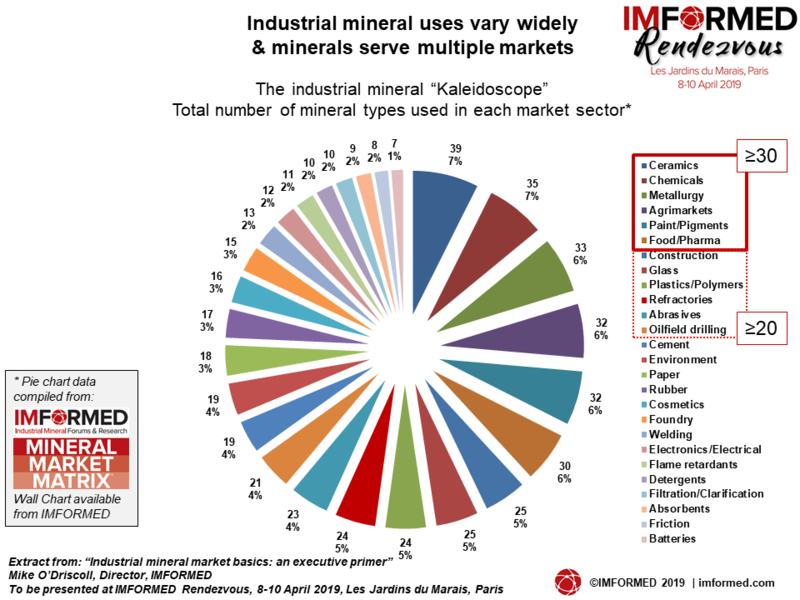 Thus, the performance of the mineral consuming market drives industrial mineral demand. 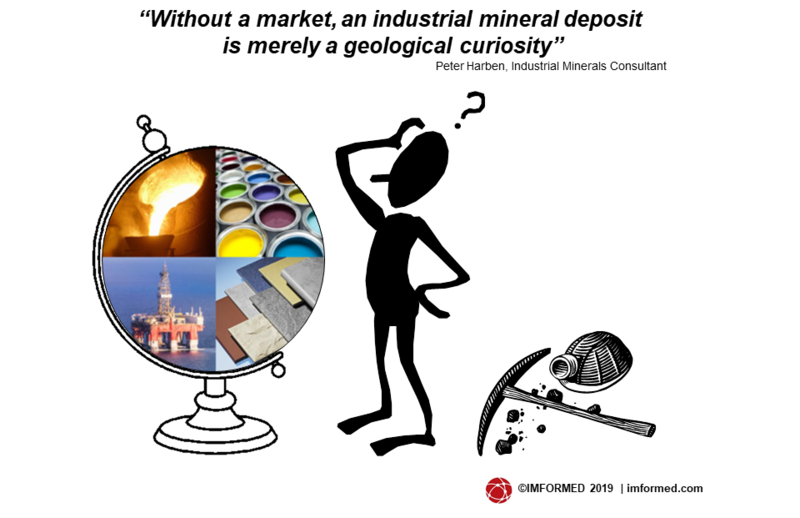 In a nutshell: no market = no mineral demand = no mineral development. Each of these points can merit an article or conference on their own. However, here we just want to show a few examples. Most industrial mineral markets follow GDP performance which is usually a reliable indicator of market outlook. 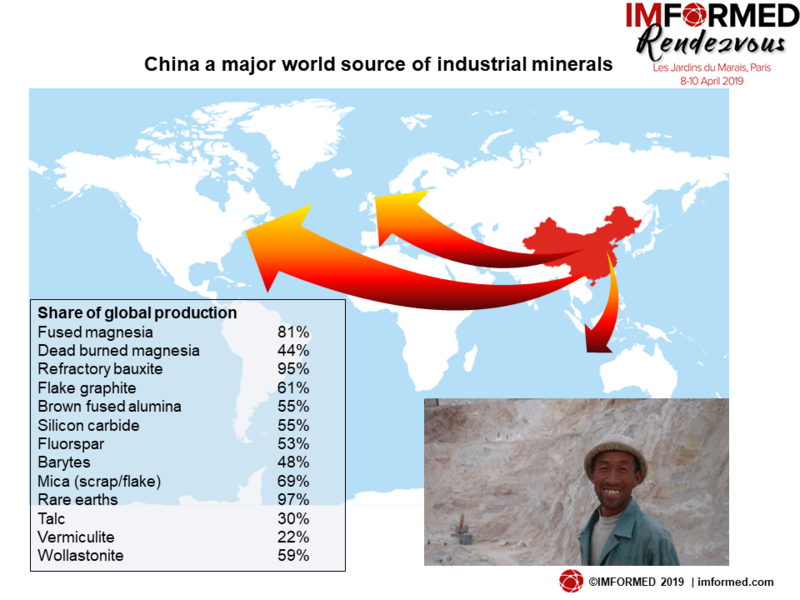 Infrastructure development and urbanisation are primary drivers for industrial mineral markets, hence the growth in demand in China and India (check out Indian Minerals & Markets Forum 2019, 18-20 November 2019, Mumbai), and other Asian countries. 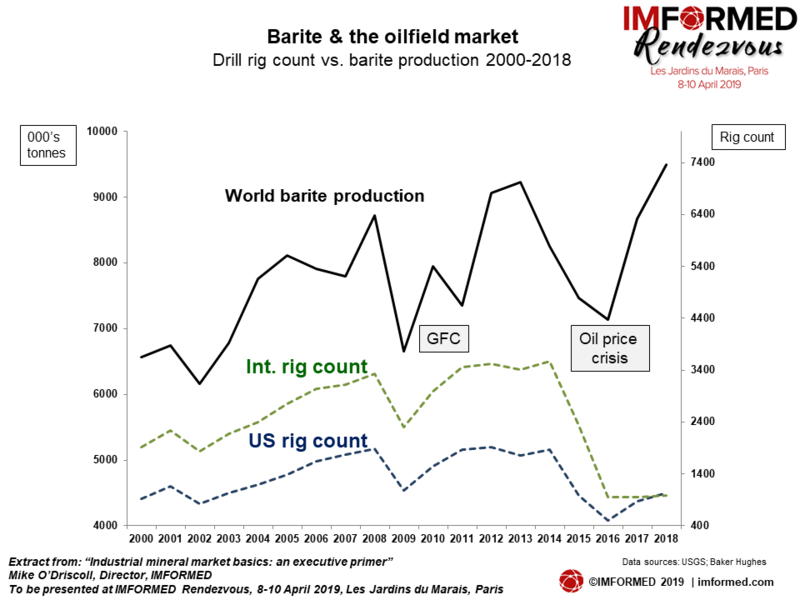 A classic example of market performance mirroring mineral demand can be seen in the use of minerals in the oilfield sector, such as frac sand as a proppant in hydraulic fracturing and barite as a weighting agent in drilling muds (its major application, latest trends and outlook to be discussed at Oilfield Minerals & Markets Forum Houston 2019, 10-12 June). International trade relations can also have a major impact on industrial minerals trade, as evidenced by the ongoing US-China trade talks and recent import tariff legislation. For example, after industry lobbying, crucially for the US oilfield industry, barite was excluded; and for the US refractories industry, the following refractory minerals were excluded from imposed new tariffs: bauxite, brown fused alumina, graphite, magnesite (fused, caustic and dead burned), silicon carbide, tabular alumina. However, most other minerals remained on the list, including andalusite, chamotte, dolomite, fused silica, kaolin, mullite, quartzite, sillimanite, zircon. 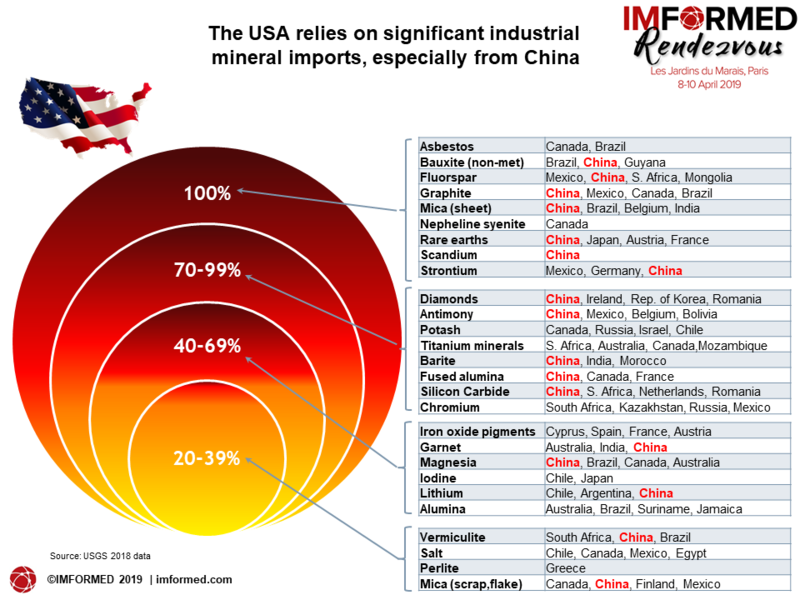 A look at the imports of industrial minerals by the USA and Europe usefully serves to illustrate the influencing factors of not just international trade relations, but the reliance (and increasingly an issue, the overreliance, which enhances the mineral’s “criticality”) of these regions on limited sources of mineral supply, notably China. The exercise also underlines the importance of logistics to ensure mineral supply reaches its intended markets. Already well into 2019, China’s mineral supply squeeze continues to challenge world refractory (and other) producers, and from most indications 2019 Chinese Year of the Pig is likely to live up to its name. 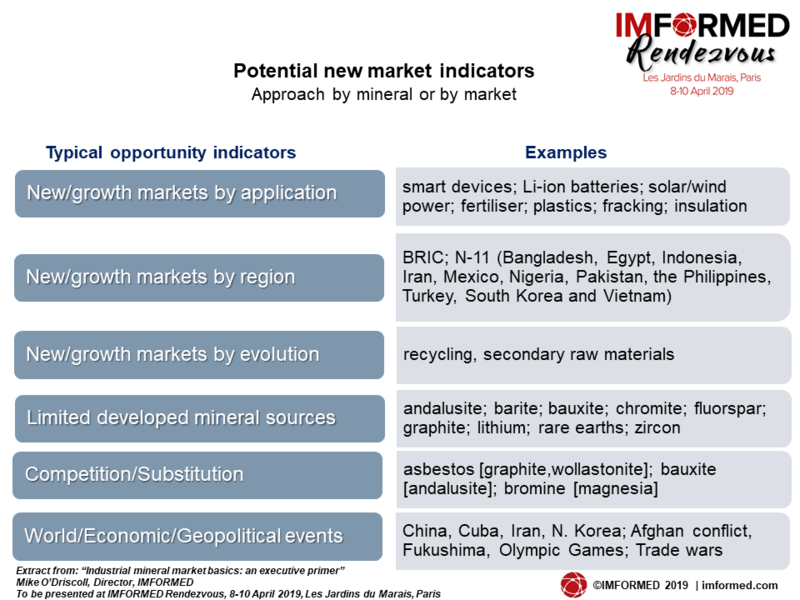 A range of factors arising in 2017 and spilling into 2018 significantly compounded the shortage of key refractory (and other) mineral exports from China vital to the world’s refractory manufacturing sector (for a review please see China’s refractory mineral supply – a New World: review & outlook; and In the Media). The situation created real problems for refractory manufacturers requiring the likes of dead burned magnesia (DBM), fused magnesia (FM), calcined bauxite, graphite, and fused alumina. China is well known as the world’s primary source of many industrial minerals. What is fundamental to understand is that despite past supply bottlenecks occurring over the last two decades, these were short-lived. This time it’s serious, it is not a cyclical phase. The fall-out is unlikely to be temporary for many Chinese mineral and end manufacturing operations. Unfortunately for the global refractories industry, where certain regions, especially India, have relied almost entirely on raw material supply from China, the crisis continues apace into 2019 and the world market must react and adapt to the new world of Chinese refractory mineral supply. Certainly, some of the larger western refractory producers will seek to do what they can to secure and “stabilise” as much as possible mineral supply from their favoured sources in China – and Refratechnik is demonstrating one way of achieving this with its joint venture to develop a 100,000 tpa DBM flotation plant at Pailou, Haicheng, partnering with Haicheng Guotian Mining and Yingkou Jinlong Refractories. However, the situation in China has boosted prospects for alternative raw material sources outside China, sparking both expansions at existing operations as well as development of new projects. First Bauxite Corp., funded by Resource Capital Funds, continues to develop its Bonasika, Guyana bauxite deposit for refractories and ceramic proppants. Mine and wash plant construction is underway, and expected on-stream end-2019. The company is already shipping raw ore to ARCIRESA, Oviedo, Spain for calcination and sales. Bautek Minerais Industriais is also developing a refractory bauxite deposit, in Goiânia, Brazil. The company is looking to produce 1m tonnes of raw bauxite, feeding a milling plant in Barro Alto, GO; and 3,000 tpm calcination plant in Jundiaí, SP. Another 6,000 tpm calcination plant is planned in 2020 at Barro. Australian Bauxite Ltd is evaluating a refractory bauxite deposit at Penrose, NSW, Australia, and has already commenced mining at its Bald Hill bauxite mine in Tasmania, selling fertiliser grade bauxite, with cement grade shipments planned during Q2 2019. Regarding magnesia developments these include expansions and upgrades at: Turkmag, Turkey (Cihan Group), Askale, eastern Anatolia – a second rotary kiln 2019-20; Demireller Mining AŞ, Turkey – purchased 90,000 tpa rotary kiln and plans DBM production; JORMAG (Manaseer Group), Al-Safi, Jordan – recent start-up of CCM and planning DBM production. Greenfield magnesia projects include AusMag (Korab Resources), Winchester, NT, Australia; Thessally Resources, Huandot, NT, Australia; Leigh Creek Magnesite Pty Ltd, South Australia; EcoMag, Western Australia; MGX Minerals Inc., Driftwood Creek Magnesium Project, Brisco, BC, Canada; Karnalyte Resources, Wynyard Potash Project, SK, Canada; Magnésie du Rif, Boudkek, Morocco (these and other magnesia market developments will be covered at MagForum 2019, 13-15 May 2019, Bilbao). 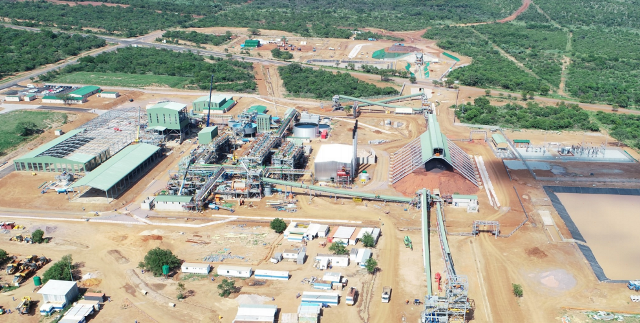 SepFluor has almost completed construction of its Nokeng Fluorspar Mine in South Africa and official handover of the mine from the EPC contractor is expected to take place early April 2019. Total acidspar production for 2019 is estimated at 106,000 tonnes and 62,000 tonnes of the 40% forward sales at fixed pricing has been committed in FY 2019 (SepFluor is Welcome Reception sponsor to Fluorine Forum 2019, 21-23 October, Prague). Canada Fluorspar is apparently looking to 2019 for a ramp-up in production. The company appointed new CEO Bill Dobbs in August 2018. Early August 2018 saw its first commercial shipment of 4,700 tonnes leave Marystown port, Newfoundland, for Houston, USA, while recent tests have been conducted by consumers in Europe. ALCORE Ltd, a wholly owned subsidiary of Australian Bauxite Ltd, is developing a plant to produce aluminium fluoride for Australasian aluminium smelters. Most recently the ALCORE laboratory was completed to lock-up stage ahead of schedule and well within budget, at Berkeley Vale, NSW. Funding is in place to complete Stage 1, followed by up to five months of production. 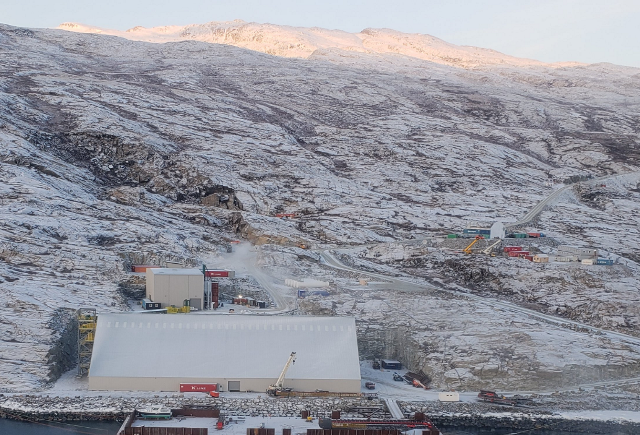 On 4 February 2019, Hudson Resources Inc. announced that commissioning had been completed and production ramp-up commenced at its White Mountain Anorthosite mine in Greenland. The calcium feldspar mine is permitted for 50 years and Hudson is expecting to start shipments to US glass, filler, and coatings customers via Charleston, South Carolina. Anorthosite has potential as a replacement source of alumina, and has already been developed as feedstock raw material for mineral wool production by Paroc in Finland (acquired by Owens Corning early 2018). Seeking new markets and looking to diversify are the essential mantras of the industrial minerals producer. The approach to this maybe by mineral, market, or by geography – each influenced by factors described earlier. A great example of new/growth markets by application is the evolution of lithium-ion batteries and smart devices. Here industrial minerals are in demand in several vital components and new generation battery manufacturers are already placing high demands on raw material supply. The advent of electric vehicles (EVs) and the emergence of battery energy storage has sparked a wave of LIB megafactories being built (of 70, only 1 is in the US, and more than half in China). “The supply of lithium, cobalt, nickel and manganese to produce the cathode for these cells, alongside graphite to produce battery anodes, needs to rapidly evolve for the 21st century. 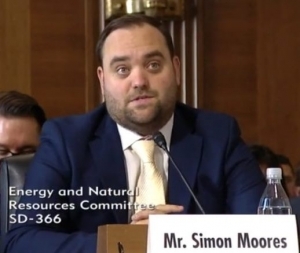 However, the scaling up of these chemically engineered materials, which are not commodities, is a major challenge for the industry.” said Moores (listen to Simon Moores talk about “Battery evolution & supply chain – what does it mean for industrial minerals?” at the IMFORMED Rendezvous, 8-10 April 2019, Paris). • High purity alumina (HPA; sourced from bauxite, aluminas, aluminous clays) is used in surface coatings for LIB separators and electrodes (speciality alumina producer Alteo has recently joint ventured with Ginet Group for China’s battery market to form Alteo-Ginet (Suzhou) Lithium Battery Material Technology; five companies are developing kaolin sources in Australia to produce HPA).